Active ECO helps improve fuel efficiency by controlling the engine and transaxle. Fuel-efficiency is determined by the driver's driving habits and road conditions. 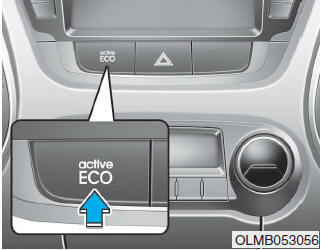 If Active ECO is turned off, it will return to normal mode. Vehicle speed may slightly be reduced. Air conditioner performance may be affected. Active ECO is designed on the assumption of light to mild throttle driving style to control engine and transaxle in order to optimize fuel economy. A person with an aggressive throttle driving style may find the engine performance in Active ECO on mode to be unsatisfactory, and thus may not realize any fuel economy gain. In such an aggressive driver style case, it would be better to keep Active ECO off for best fuel economy. For best results, it is recommended to compare the performance of both modes to determine which is more effective for your driving style. If the following conditions occur while Active ECO is operating, the effectiveness of the Active ECO may be limited even though the indicator is still on. When coolant temperature is low: The system will be limited until engine temperature becomes normal. The system will be limited to gain power when driving uphill because engine torque is required. When using sports mode: The system will be limited according to shift request.